The life sub-aquatic is a particular one indeed. 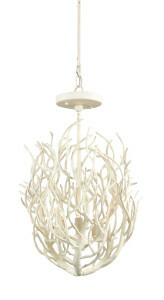 You can tell our fascination with the nautical in these offerings of oceanic-inspired products. If you haven’t heard of Mangrove trees, they are the trees that grow from swamps with skeletal roots spreading below the water like fortresses… One can vividly imagine swimming through a maze of mangrove clusters and sitting within the dome of spindly roots watching life below the water. The Eventide Collection is immediately reminiscent of being a child and falling into that imagined, submerged world. 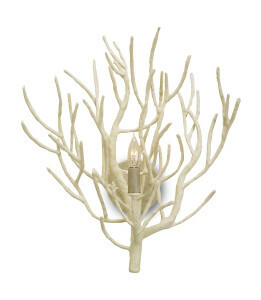 Constructed from wrought iron with a textured white coral finish, the Eventide Collection looks strikingly like the inverted undersea forests. At first glance, their structures may resemble some kind of visual confinement but, the spiny arms of each piece reflect a layer of protection, not restriction, around the lights within the frame. As mangrove trees seem to be a protective layer for underwater life and safety to the ecosystem, the Eventide Series is the same to protecting the beauty of the luminance at their core and keeping the light alive for us in the evening. We hope you enjoyed this exploration of sub-aquatic products that were inspired by the sea! 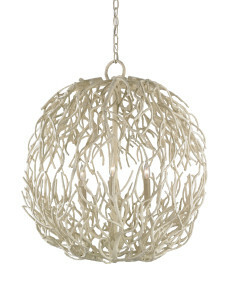 This entry was posted in Currey & Company, Products and tagged Chandeliers, design trends, Lighting, Natural, nautical, organic shapes, Wall Sconce, White on November 26, 2013 by Currey & Company.